My dear friend Dexter and I had an impromptu lunch at Spatzle Euro Market Cafe, a far cry from our Japanese lunches. Spatzle, named after a German soft pasta, serves European comfort food. Each table has this cute container with utensils and hand sanitizer. I find this really impressive because the washrooms are a few steps away. While waiting for our dishes, we had their Haus Made Specialty Drinks: I had the Cucumber Lemon Soda (Php 135) while my friend had the Peach Breezer (Php 105). I liked how simple and refreshing my drink is. My friend found his drink too acidic for his taste. For the main dishes, I ordered the Grilled Sausage Roesti (Php 320), and my friend got the Parmesan Crusted Mahi-Mahi with Aurora Spatzle (Php 385). My friend's order is baked mahi-mahi with parmesan crust, served with tomato cream spatzle and a side salad. The fish was a little oily, and the spatzle goes well with it. The dish was a healthy choice nevertheless. For dessert, we shared a Trio of Assorted Cakes (Php 290): Sticky Toffee Pudding, Zucchini Cake and Nutella Cheesecake. We were both amazed by the Zucchini Cake, which is covered with cream cheese frosting. I would love to have this dessert again. As a Nutella addict, I loved the Nutella Cheesecake as it wasn't too sweet. However, we found the Sticky Toffee Pudding too sweet. 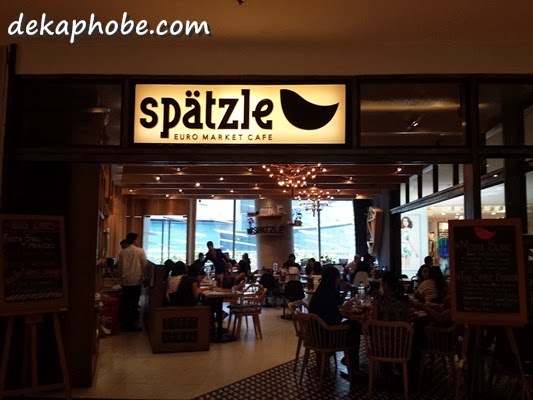 For it's homey ambiance, comfort food and huge servings, I would recommend Spatzle. Don't miss the Zucchini Cake and Nutella Cheesecake as well. I would love to go back to try the other roesti and spatzle dishes. Been seeing a lot of mason jars in the restaurants that you've been featuring of late. Isn't it too obvious I am sort of obsessed about them hehe... My exposure on European food is not that big so this post is particularly interesting for me. This is the first time I've heard of a sweet potato pancake, I didn't know there is such a thing. I love dessert so I will definitely order this trio of assorted cakes!